Hartford, CT… Permatex®, a leading innovator in chemical technology for automotive maintenance and repair, offers an advanced, form-in-place gasket maker that creates a quick, reliable seal without the need for curing time. Permatex The Right Stuff® 1 Minute Grey Gasket Maker allows technicians and do-it-yourselfers to make leak-proof gaskets in one minute and put the parts back right back in service. The Right Stuff Grey’s formulation features an elastomeric rubber gasket technology, which is specifically designed to perform under the higher torque loads associated with import vehicle engines that have closely spaced bolt patterns. It is specified by major import OEMs and is resistant to powertrain fluids such as oil, coolant, and ATF. Permatex The Right Stuff 1 Minute Grey Gasket Maker makes gaskets in just one minute and allows parts to be put back in to service immediately. 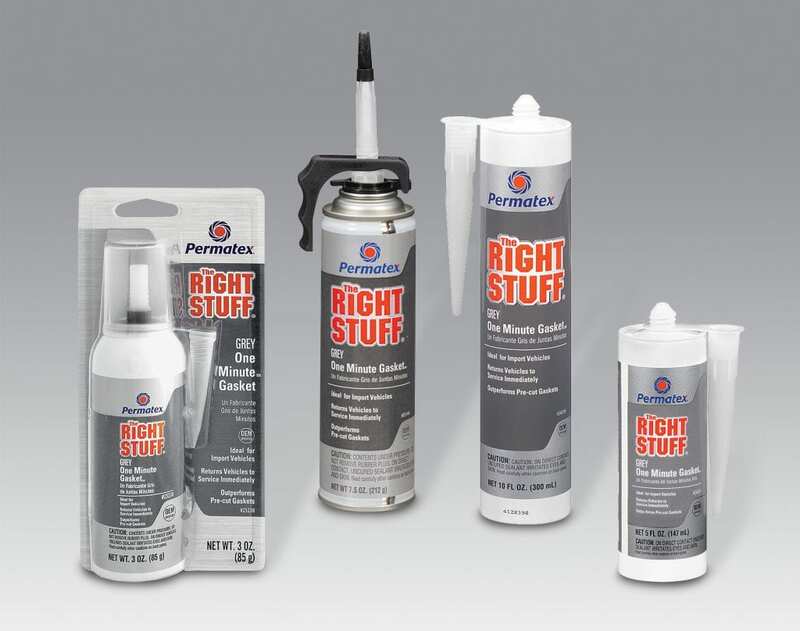 Permatex The Right Stuff 1 Minute Grey seals instantly and is blowout resistant. It can withstand temperatures ranging from -75 ºF to 450 ºF continuous and 500 ºF intermittent. The Gasket Maker is sensor-safe and resistant to powertrain fluids including ATF, coolant, and oil. It is offered in a variety of handy sizes to meet any job requirement: 3 oz. power cans, 7.5 oz. PowerBead™ pressurized can, 5 oz. cartridge, and 10.1 fl. oz. cartridge. Suggested applications include automotive gaskets, valve covers, oil pans, transmission pans, thermostat housings, and water pumps. In addition to The Right Stuff 1 Minute Grey Gasket Maker, Permatex also offer The Right Stuff 1 Minute Black Gasket Maker, which is fleet tested to be leak-free in more than 5 million miles of heavy commercial use. Editor’s note: Form-in-place gasket makers should not be used in place of head gaskets.